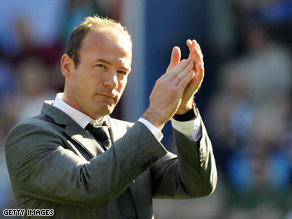 Newcastle to talk to Shearer about "how to move forward"
Shearer says it was "worst moment of his career"
CNN -- The managing director of Newcastle United, Derek Llambias, has told the club's Web site he will be in talks with manager Alan Shearer this week to see whether the former England striker will continue in the role despite the team being relegated from the English Premier League on Sunday. Alan Shearer will talk to Newcastle United later this week about his future. Llambias said: "Being relegated from the Premier League is a huge disappointment for everyone involved with Newcastle United, but (club owner) Mike Ashley and I will sit down with Alan this week to discuss how to move forward again." "We are all hurting and I feel desperately sorry for everyone associated with Newcastle United; we hope to be able to say more to our supporters later this week." Shearer, 38, agreed to takeover temporary control at Newcastle in April for the remaining eight games of the season with the hope that he could turnaround a side struggling with relegation form. But with only one win and five defeats Shearer was unable to steer the side to safety, a 1-0 away defeat to Aston Villa on Sunday consigning the side known as the "Magpies" to the second division of English football for the first time in 16 years. Shearer, formerly a prolific striker for the side and a hero among the fans, told the club's Web site it marked the "worst moment of his career" but would not confirm whether he would stay on to manage the club next season. "It's painful and it hurts. "We went down because we were not good enough over 38 games - there were no excuses. We feel for the fans as they deserve better. "Big changes need to be made at this club, players need to go and others have to arrive because, collectively, we were not good enough to survive," he added. Newcastle's 18th defeat of the season and confirmation of an end to top-flight status was the final act in a dramatic season for the team from the north east of England. Kevin Keegan quit as manager in September after eight months in charge, a move that angered many fans and led to public displays of opposition towards those running the club. Following this owner Mike Ashley put the club up for sale after telling the club's Web site he was "unable to watch the team due to fears over his family's safety." "I'm now a dad who can't take his kids to a football game because I am advised that we would be assaulted," he said. Joe Kinnear was then taken on as an interim manager before ill-health forced the former Wimbledon boss to be replaced by Shearer.